Durian can be made into an excellent ice cream, or a cold milk shake. As a blender ingredient, though, it seems the king of fruits does not mix well with lesser commoners. The distinct durian flavor usually dominates, and in some cases mixing with other fruits accentuates the garlicky component of durian in unfavorable ways. However, other fruits with sufficiently strong flavor, notably coconut and to a lesser extent pineapple, do blend well with durian, and make a good smoothie together, and no doubt there are some excellent exotic blends of durian and other fruits waiting to be discovered by modern tropical kitchen adventurers (eggfruit? champedak?). One known harmonious flavor with durian is coffee. Drinking coffee while eating durian is quite pleasant, and a durian-flavored gourmet coffee would be an exotic treat. 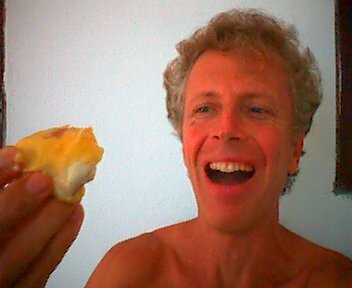 Durian makes a very good "dried" fruit—actually in Southeast Asia it is not really dried but cooked down for hours into a thick sweet paste which keeps well for a long time. When unripe, durian can be cooked like a vegetable — including frying unripe slices just like potato chips to make uncommonly good durian snack chips. A popular delicious dessert treat in Thailand (approximately pronounced "Khao Nam Ka Tea Turian"), often sold from roadside cart vendors, is a cup of sweet sticky rice flooded with a very sweet thin syrup of the juice of fresh coconut blended with a little fresh durian, sweetened with sugar cane juice. Malaysia is famous in Southeast Asia for its durian dodol; they call it a cake, but it’s more like a tasty, slightly spongy, brown congealed cooked (or baked?) mass of durian, coconut flower water, coconut milk, palm sugar, and glutinous rice. Also in Singapore, where most people love durians and large quantities are imported from Malaysia and Thailand, can be found the world-famous Four Seasons Durian Dessert Shop (located at 51 Telok Ayer Street, #01-21/22, China Square Food Centre, Singapore 048441, tel 532-7576, fax 532-0696). This shop is a durian gourmet's paradise. Everything on the menu is made with durian — and exquisitely so.